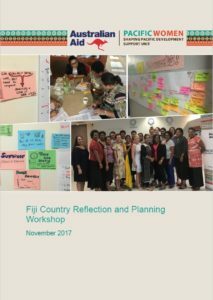 The Pacific Women Shaping Pacific Development (Pacific Women) Fiji Country Plan program (the Program) held an annual reflection and planning workshop for partners from 21–23 November 2017. The purpose of the workshop was to share findings from the Fiji Country Plan Review and the Pacific Women Year Three Evaluation and consider the implications of findings for future Pacific Women programming in Fiji. The workshop was facilitated by the Fiji Country Plan Monitoring, Evaluation and Learning (MEL) adviser, the Pacific Women Support Unit and Fiji Women’s Fund. The workshop was designed to maximise input from local experts, as well as provide the opportunity for peer sharing. In addition, exercises were developed to ensure partners strengthened or developed new relationships with each other.